Fort George was built from 1706 - 1710, on an early battery erected by the French in the 1600s, and originally named Fort Royal, it was renamed Fort George in 1763, in honour of King George III when the British took possession of the island, Consequently, 2006 - 2010 would be its 300th anniversary. It is basically a small bastion tracer fort, which means that each level can give covering fire for the other level, and has been in constant use in one form or another since it has been built. It was once the heart of the town, but as the town has grown and times have changed, it has been relegated to being used as a simple extensive building. 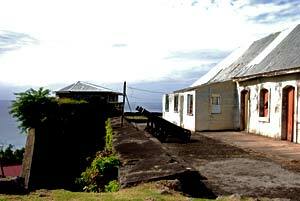 Currently, it houses the Royal Grenada Police force, but has sections which are open to the public. If you are looking for a fabulous view of the town and the harbour, then this is one site which should be on your list of places to visit. There is a viewing section towards the inner harbour with plaques showing the important landmarks, and several of the old cannons. The stroll up to the fort from town is a bit of a climb, so its advisable to take your time and also, don't forget to bring your camera. 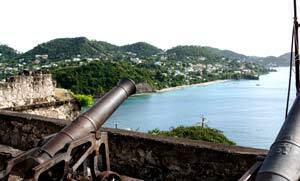 From the walls on the southern section of the fort, you can see along the southern coastline towards Grand Anse beach and the extreme tip of the island, where the international airport is located. Just to the west, you can also see the new cruise ship terminal and overlook the heart of the town. While it may not have the God's eye view that its counterpart, Fort Frederick, does, you will get the chance to see and feel a living fort which has not outlived its usefulness to this day. 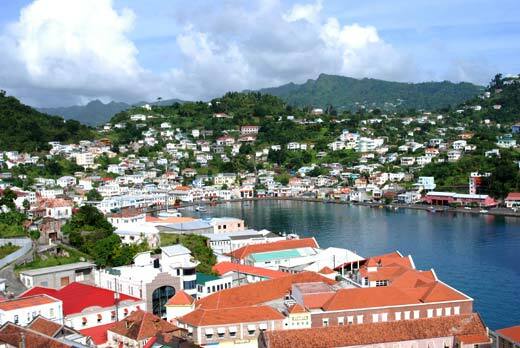 If the stones could talk, just imagine the stories they could tell, as many aspects of Grenada's political and historical life have happened here. Getting there is quite easy, as there is access from next to the exit to the Sendall tunnel via steps, or the main road which continues on to the General Hospital. 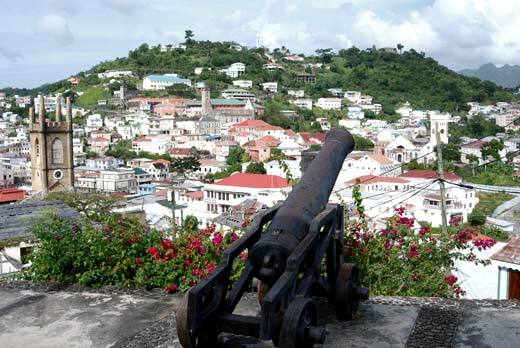 Its hard to miss Fort George with its commanding view of the town of St. George and the inner harbour.